In Business Mensch, Noah Alper gives you the practical skills you need to make your business the best, while exploring larger questions of morality and work satisfaction. Learn entrepreneurship from a business leader with 35 years of experience and start down a path to success using timeless wisdom as your guide. 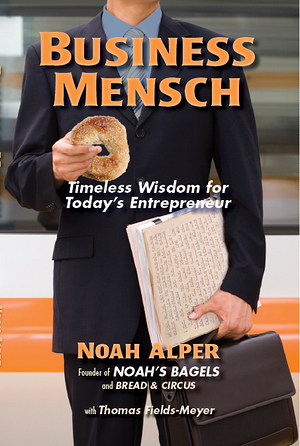 Just as Noah's Bagels with its distinctly Jewish roots appeals to all kinds of appetites, Business Mensch provides nourishment for a variety of readers, helping them excel in both business and life. Business Mensch has been awarded a silver medal in the category of Business Ethics in the 2010 Axiom Business Book Awards! Designed to honor the year's best business books and their authors and publishers, The Axiom Business Book Awards are intended to bring increased recognition to exemplary business books and their creators, with the understanding that business people are an information-hungry segment of the population, eager to learn about great new books that will inspire them and help them improve their careers and businesses.